It's been a busy catering week folks! I think I have made my weight in mini quiche, lamb pies and sandwiches.....oh so many sandwiches! Anyway, enough about that. 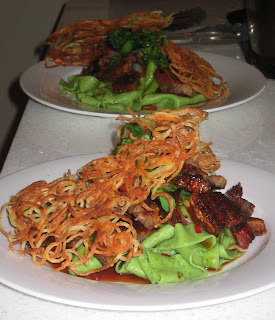 I have also been doing a lot of yummy dishes and teaching a few classes of late. Last Saturday I spent the evening teaching a class some quick and delicious tapas dishes. A really fun night and the group I taught were loads of fun and really loved food. I was practicing all week on a few dishes as it had been a while since I made the baby octopus and I kinda made up a few recipes on the fly, so before I taught a class of eager students I thought I had better give all the recipes a trial run. Now I WAS going to blog about my dishes today but I have to leave them for a day longer to do a bit of a 'show and tell'. You see I rang my parents yesterday to have a chat, talk kids, weekends, food and more food. I mentioned how much Max loved the octopus I made the other day when mum casually tells me they went for lunch over the weekend, paid a stupendous amount for a very average meal. To pick their (meaning mum and dad) spirits up they decided to make themselves a 'Master chef' inspired dinner. I just got sent the photos and thought I would share them with you. 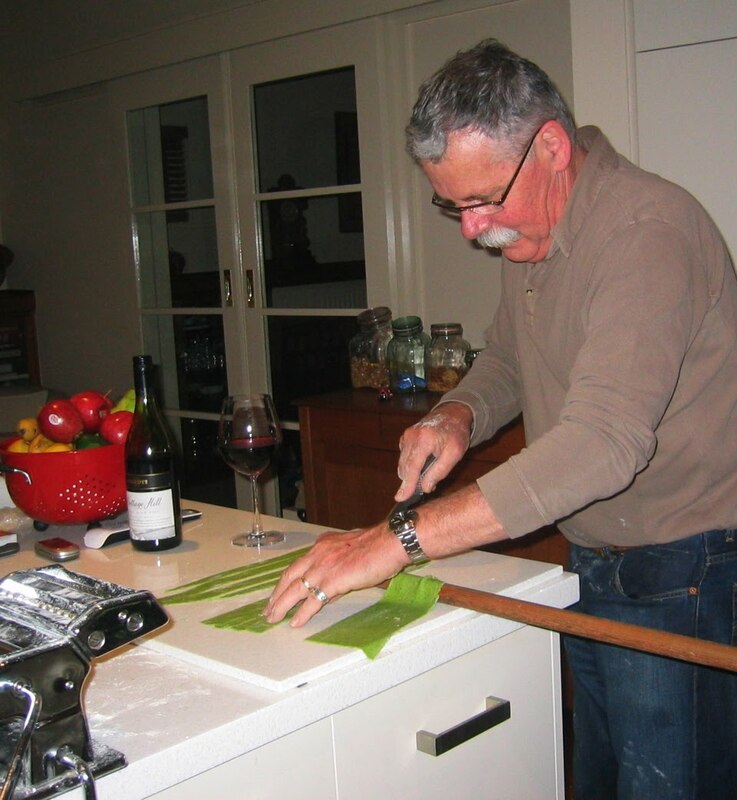 I also have to tell you that growing up my dad rarely ventured into the kitchen. One very memorable kitchen experience was to do with rabbit, however I can't really say meal because by the time it was 'ready' my sister and I were half asleep and the rabbit was too tough to be eaten. I think dad took this as his leave from the kitchen for many a year. He stuck to what he knew best and that was omelette's. Dad can make a killer omelet to blow your mind and eyes (great height), but everything else kind of got left to mum, who whipped up feasts right before our eyes. Anyway, I hope you enjoy the photos as much I as did. 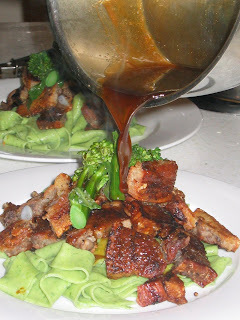 I'm thinking I might even give the pasta a go this weekend.......whats the recipe with the pork mum? 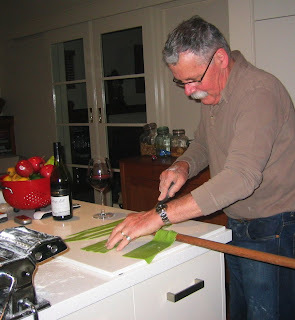 This is dad cutting his pappradelle, I think he has become the master of pasta! Say no more! 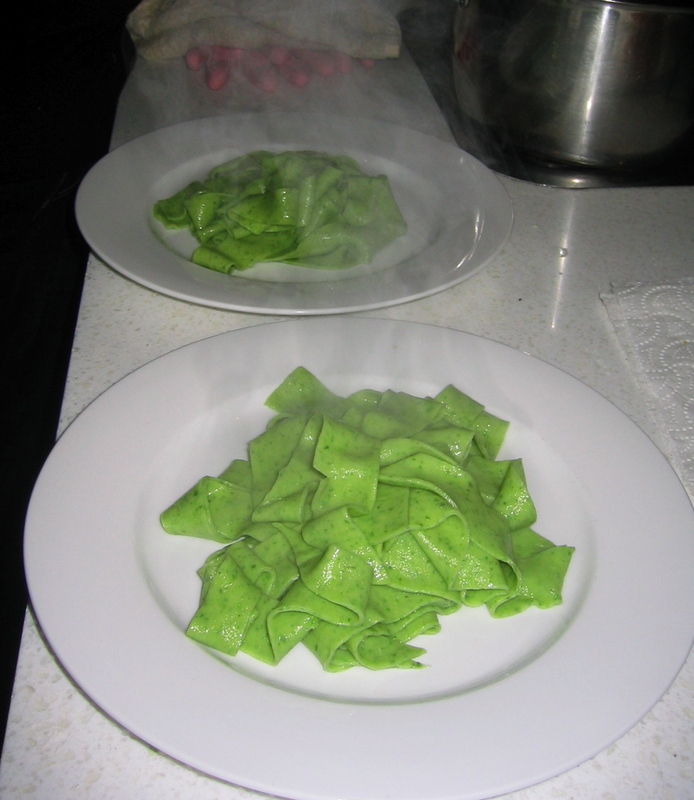 The freshly cooked pappardelle . . . note the chlorophyll texture and colour. . .
Now on goes mum's roast pork belly, followed by the caramel vinegar sauce and broccolini sprinkled with fresh chopped chilli . . .
. . . then topped with a squiggly potato crisp ( just for the crunch) Served with a lovely pinot. As you can see.....how do I compete with that?? Well done mum and dad, we can't wait to taste it on our next trip down. I love it that your parents are foodies and still have such enthusiasm for making adventurous food. Camilla, thank you so much for buying my book. I hope you enjoy it.